Want to look good no matter the occasion? Bed Head's Three Panel Lighted Mirror allows you to check yourself out from every angle: Morning After, Hanging Out, Flashing Lights, and Night Life. 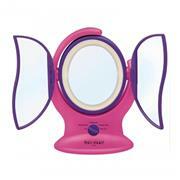 Features: 3 panel mirror, 360 mirror rotation, 1X/3X magnification, rim lighting, corded.